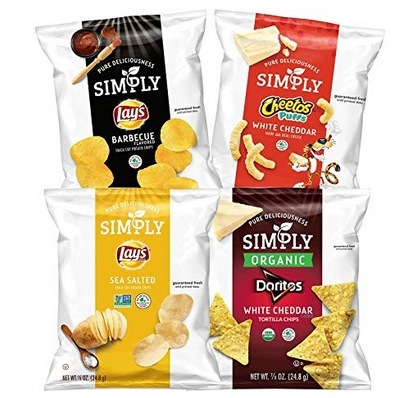 Simply Brand Organic Doritos Tortilla Chips, Lay’s Potato Chips, Cheetos Puffs, Variety Pack (36 count) only $10.70 shipped! Amazon has this Simply Brand Organic Doritos Tortilla Chips, Lay’s Potato Chips, Cheetos Puffs, Variety Pack for only $10.78 shipped when you clip the $2.50 off e-coupon and checkout through Subscribe & Save! That’s like paying only $0.30 per bag shipped. « So Delicious Frozen Mousse Pints only $0.98 at Walmart! Next articleSo Delicious Frozen Mousse Pints only $0.98 at Walmart! Snappers Chocolate Pretzel Snacks only $1.99 at Target! Bicycle Playing Cards (2 Decks) only $3 shipped! SmartyPants Kids Complete Daily Gummy Vitamins (120 count) only $8.62 shipped! Dove Promises Variety Mix Chocolate Candy, 150 pieces only $11.55!